Facebook’s Canvas full-screen immersive ad product will be made available for organic page posts June 22. The social network introduced Canvas for iOS and Android smartphones in February. That will let you publish a post with the Canvas attached, and you can decide on the thumbnail image. Please note that as a page administrator, you will be able to see Canvas posts on desktop so you know they were published, but to everyone else, these posts will only display on mobile, because Canvas is only available on mobile. The social network added that once a Canvas is created, its URL can be pasted into a page post, adding that once Canvas has been used once by a page, that page’s Pages Composer menu will feature a “Create a Canvas” option in its drop-down menu. Facebook users have spent the equivalent of more than 100 years viewing Canvas ads, and the average visit is 31 seconds. During the past two months, Facebook users in 186 countries have experienced Canvas ads, and the top 10 countries are: the U.S., Brazil, Mexico, Italy, the U.K., France, Thailand, Germany, Turkey and India. More than 50 percent of Canvas ads were built in 10 minutes or less. Ad creators can go from opening Canvas builder to previewing their ads on mobile in less than one minute. A sports team (Miami Dolphins) used Canvas as a virtual baseball card introducing a new player, complete with team colors, fun facts, vital stats, video of his greatest hits and quotes from coaches–more story than a single photo could possibly tell. Facebook Canvas: Miami Dolphins from SocialTimes on Vimeo. A landscaping company (SGK Landscapes) brought prospective customers through a portfolio of its past landscape design and maintenance work, using immersive tilt to pan images of home interiors, carousels showing different homes it designed and listing its services and videos of growing grass. Facebook Canvas: SGK Landscapes from SocialTimes on Vimeo. A dog portrait company (My Pooch Face) used Canvas to walk potential customers through the simple process of commissioning a hand-painted portrait of their dog and took them behind the scenes to see artists working alongside dogs in the studio. Facebook Canvas: My Pooch Face from SocialTimes on Vimeo. An online men’s shoe company (Eager&Co.) used Canvas to show people what sets it apart from traditional retailers, using tilt-to-pan photo and carousels to tout its high level of service and the high-quality construction of its shoes. Facebook Canvas: Eager & Co from SocialTimes on Vimeo. A healthcare provider nonprofit (Dignity Health) used Canvas to introduce interesting healing remedies used around the world, including the ancient Iranian tradition of using rose water to treat ailments. It used video interviews with experts, tilt-to-pan photos, text and carousel images with recipes. Facebook Canvas: Dignity Health from SocialTimes on Vimeo. 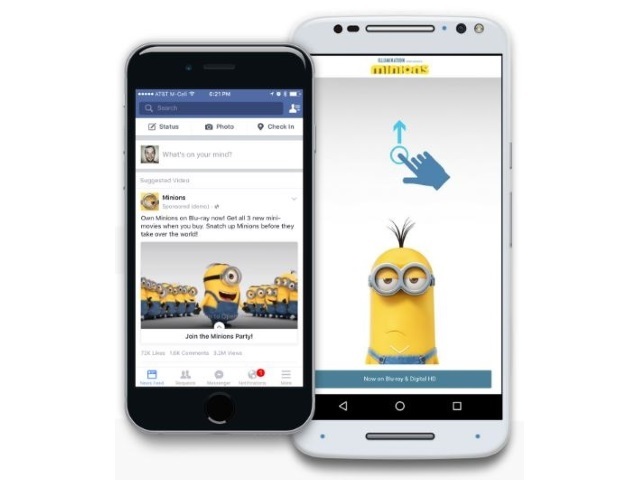 Readers: Have you experienced Facebook Canvas ads yet?